Taking an electric car prototype capable of speeding up to 240 kph, State Enterprises Minister Dahlan Iskan of Indonesia, admitted to have broken the law "for the sake of science and technology," reports said. 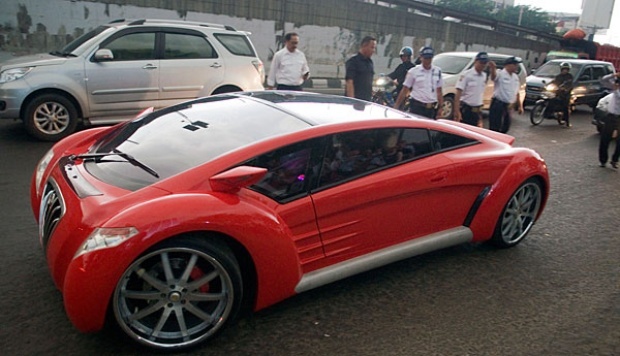 The Jakarta Globe reported that Dahlan took a red "Tucuxi" prototype electric car for a 1,000-km test drive on a public road while using a fake license plate on Saturday, Jan. 5. The car's brakes failed, causing it to crash in East Java, Indonesia (see pic below). The Tucuxi, named after a species of dolphin, is an electric sports car designed by Dr. Danet Suryatama. On a fully charged battery, it has a range of 300 km with a maximum speed of 240 kph. "Batteries can be charged rapidly for 4 hours from empty condition," Suryatama was quoted in TheCarDriving.com. The Tucuxi will be produced in limited numbers around 200-400 units and will be sold for a price equivalent to US$150,000.